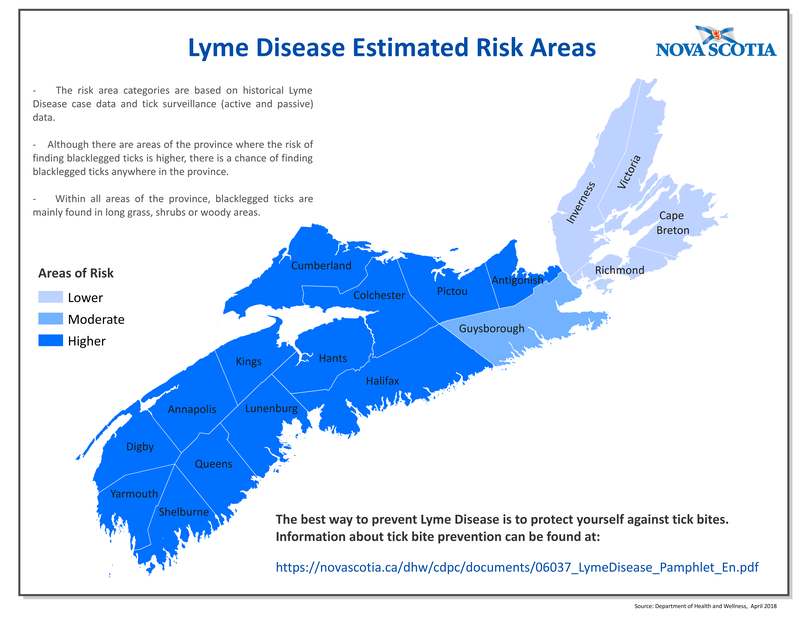 While blacklegged ticks have been long-thought to be a rural problem, particularly in western Nova Scotia, it’s been confirmed that the majority of the province has ticks, said Kelly Cunningham, recreation coordinator with the Town of Lunenburg. Last year, Cunningham completed a Masters of Public Health from the University of Victoria. As part of her studies, she spent four months working on her practicum with Public Health’s health protection team in Bridgewater, where her focus on Lyme disease. “Pretty much all of Nova Scotia needs to be aware of ticks and how to prevent Lyme disease,” she said. In 2015, there were 247 reported cases of Lyme disease in Nova Scotia; in 2016, there were 326 reported cases. As tick populations expand, the risk of Lyme disease and need for greater awareness also increases. That’s where prevention plays a big role. Some important preventative steps to take include applying insect repellents containing DEET or Icaridin to exposed skin and clothes, wearing light-coloured long-sleeved shirts and pants to see ticks better, as well as closed-toed shoes, and tucking shirts into pants and pant legs into socks. Check yourself, children, and pets after walking in grassy or wooded areas. Check clothing and inspect skin including in and around ears, arm pits, inside belly button, groin, around the waist, and especially in hair and scalp area. When possible, take a bath or shower within two hours of being outdoors. This makes it easier to find ticks and washes away loose ones. If you spend any amount of time outdoors, tick checks should become part of the daily routine for you and your family, said Dr. Robert Strang, Nova Scotia’s chief medical officer of health. One of the earliest and most common symptoms of Lyme disease, which is treatable, is a rash that’s often shaped like a bull's-eye. Other symptoms include fever, fatigue, muscle aches, joint pain and headaches. If you have found a tick on your body, and show these symptoms, see a healthcare provider. For more information about tick safety and protecting yourself and your family whenever you enjoy the outdoors, including info on how to safely remove a tick, visit novascotia.ca/ticksafety.